As pavements age and wear through time, patching is needed to fix potholes that develop. Pavement patching is one of the most widespread and costly maintenance activities undertaken by highway agencies at all levels, but is also the most inefficient. Most patching is a temporary fix that lasts only a few weeks. The quality and duration of pothole patches are largely impacted by the fact that patching activities are usually conducted in less than ideal weather conditions and when the pothole contains an abundance of water. Furthermore, patching must be completed quickly to avoid disrupting traffic flow. The key to better cold patch longevity and performance is the addition of the right adhesion promoter chemical which gives the patch the ability to displace water along the sides and bottom of the pothole and allows it to adhere properly. Without the right adhesion promoter in the patch mix, the patch will not adhere properly and patch failure is imminent. Also important to patch performance is that the adhesion promoter allows for proper cutback coverage on the aggregate and that it protects the patch from being susceptible to moisture damage after the patching mix is placed in the pothole. 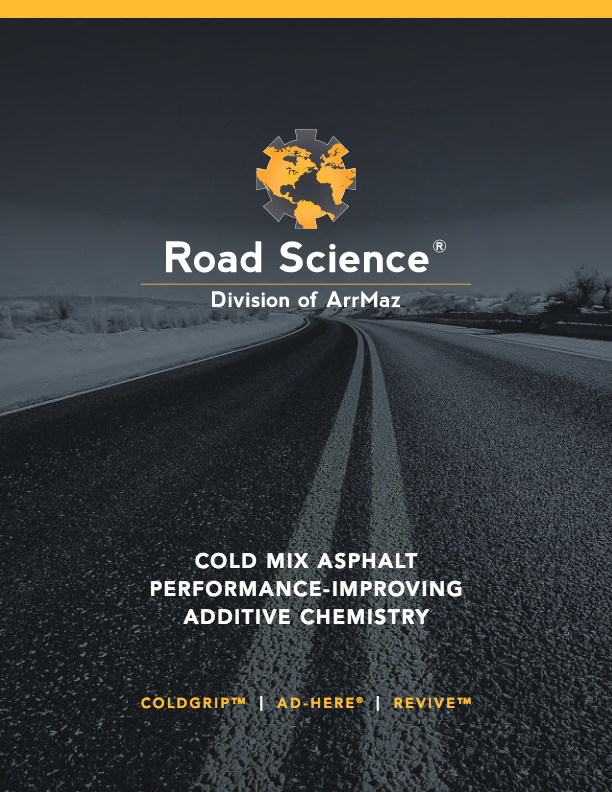 Road Science manufactures the following performance-improving asphalt additives for exceptional cold mix quality and performance, enabling you to differentiate yourself from the competition. Road Science has developed a smarter way to enable cutback asphalt use in cold patch stockpile mixes and cold mix paving applications with ColdGrip IQ. Many contractors have limited sources for their aggregates and end up paying more for higher quality stone to avoid coating challenges and stripping issues. When added to cutback asphalt, ColdGrip IQ chemically transforms cutbacks to easily coat cool, damp and dusty aggregates, eliminating coating headaches and enabling the use of less pricey aggregates for reduced costs and improved production efficiency. Cutback clings to aggregate with outstanding film thickness protecting stockpiles from rain-induced stripping, and eliminating reprocessing and wasted materials costs. ColdGrip IQ technology extends cold patch life by ensuring the patch chemically bonds stronger to pothole walls and bottom, even in the presence of water, and guarding the patch against moisture damage, stripping and aggregate dislodgement. ColdGrip IQ’s low odor and low viscosity, even in freezing temperatures, allow for easier handling and operational convenience. 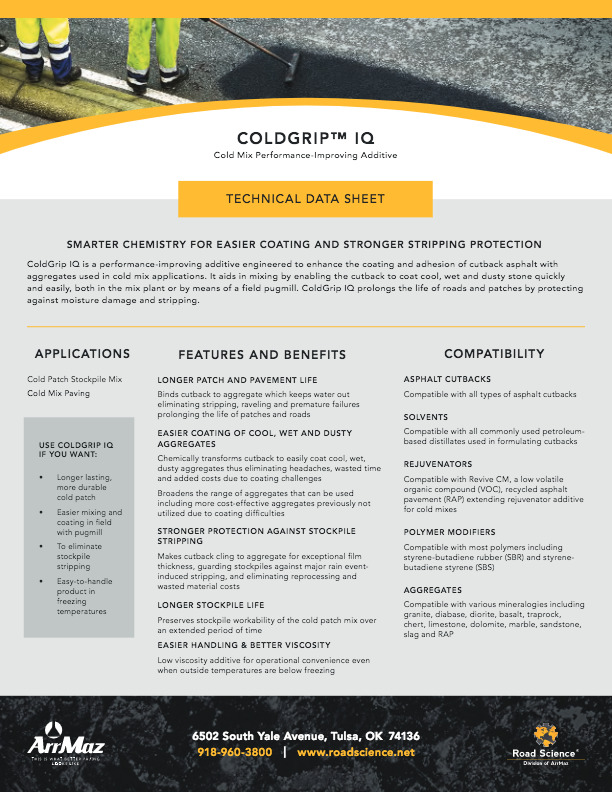 ColdGrip CM-4IQ is a combination additive added to virgin asphalt to produce low VOC cutback. It replaces both petroleum-based solvents and adhesion promoters which are typically used to make cold mix. It is important because it can be used to make low VOC, eco-friendly cold mix. This type of cold mix is gaining popularity for its environmental benefits vs traditional cold mix. CM-4IQ also acts as a rejuvenator, improving the ease and efficiency with which highly oxidized asphalt is incorporated from RAP and reintroduced back into the new cold mix. 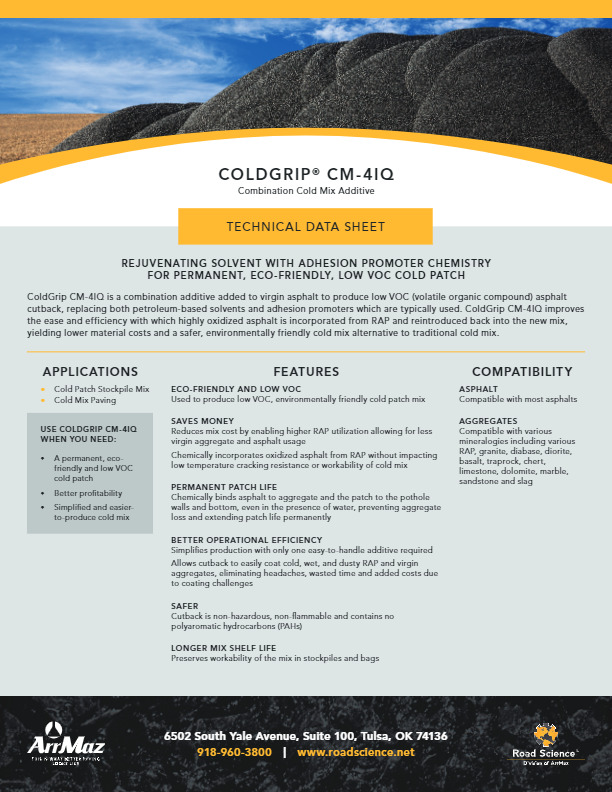 CM-4IQ streamlines production and adds operational convenience since only the ColdGrip CM-4IQ additive needs to be mixed with the asphalt to produce the cutback. The ColdGrip IQ adhesion promotor is already added in. For emulsion-based cold mix asphalt, Road Science offers AD-here SC-901 which has a tried and true 30-year reputation as the premier additive for emulsion-based cold patch stockpile mixes. Emulsions treated with AD-here SC-901 coat cool, damp and dusty aggregates better and with a thicker film, even with the most difficult-to-coat granitic aggregates which contain an abundance of quartz. 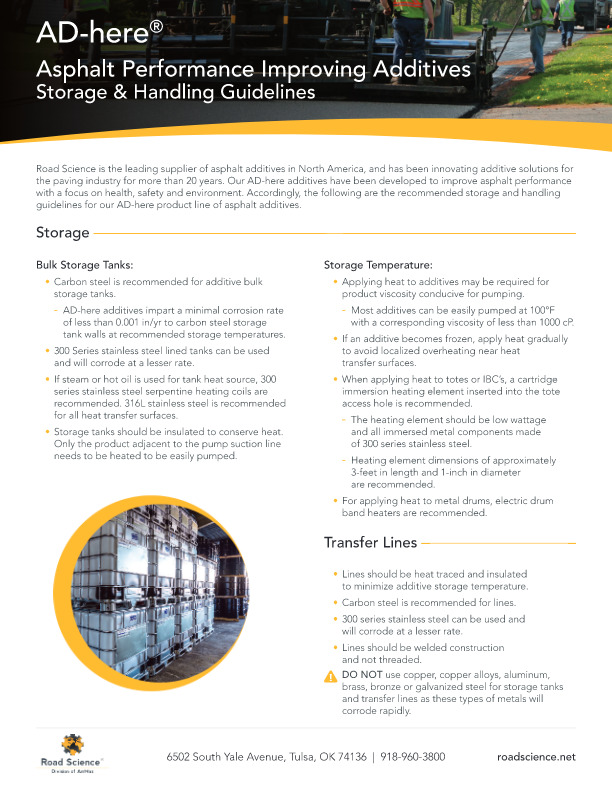 The same outstanding film thickness is safer for stockpiles and protects them from rain-induced stockpile stripping, eliminating reprocessing and wasted materials costs. 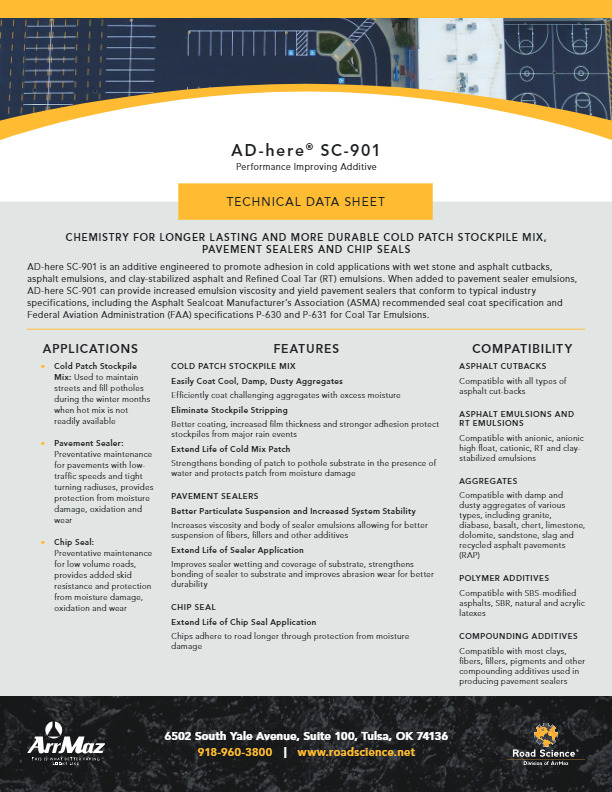 AD-here SC-901 extends cold patch life by ensuring the patch chemically bonds stronger to pothole walls and bottom even, in the presence of water, and guarding the patch against moisture damage, stripping and aggregate dislodgement. The addition of SC-901 to emulsion will not affect emulsion viscosity and stability, enabling predictable and reliable emulsion characteristics.